The “Father of Texas” saw the potential…. the future of Texas wine. 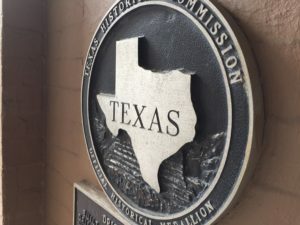 Stephen F. Austin came to Texas with the first colonizing families in the early 1800s. When he made that statement, he likely didn’t expect two centuries would pass until the Texas wine industry would reach begin to reach its full potential. Today, a tourist can drive just a few miles out of the city of Austin, the namesake of Stephen F. Austin, and find a burgeoning wine scene… not quite there, but on its way to becoming a major American wine region! I took that drive recently to visit the bold new producers that are making Texas one of the most exciting, and underrated, wine destinations in the country. My introduction to the Lone Star state led me to Duchman Family Winery and Flat Creek Estate. There is another timely impetus for my Texas travels: an upcoming webinar I’ll present for the Society of Wine Educators on December 7th titled “Emerging Wine Regions of the US”. In the webinar promo, I tease: “Who knew that Texas had such a long history of wine production, and that the state grows more Vitis species that any other region on earth?” I had research to do, and my curiosity was piqued! With most of today’s Texas producers under a decade old, it’s easy to forget a wine industry history that dates back to the 1600s! One of the earlier vineyards planted in North America lies in Texas, planted by Franciscan priests in 1662. As European settlers followed, the industry developed, and by 1900 Texas had more than twenty-five wineries. Like everywhere else in America, Prohibition brought an end to this momentum. It wouldn’t be until the 1970s that Texas would witness a revival of its wine industry. It was a bit of a later start, compared to California, but commercial vineyards and wineries started popping up. This statistic might be hard to believe, but today, Texas is currently the fifth leading state in wine grape production. Somehow, where the big four California, Washington, New York and Oregon have name recognition and commercial power, number 5 still struggles with public perception. Most people still would be surprised to hear great wine comes from Texas! Today, Duchman Family Winery and Flat Creek Estate are two of the 350 wineries that are changing that public perception. On my visit, we left the pavement and urban-ness of Austin for the rolling hills and ‘peaking’ vineyards of Driftwood, Texas. We arrived to the estate’s beautiful Italianate villa, and Jeff Ogle, General Manager, greeted us and began to share the Duchman story. Drs. 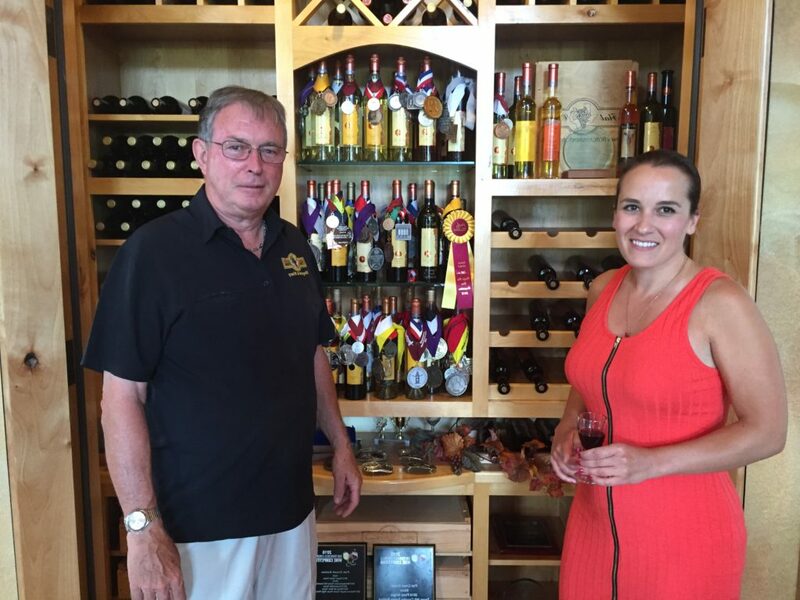 Stan and Lisa Duchman founded Duchman Family Winery in 2004 with an aim for world class winemaking. 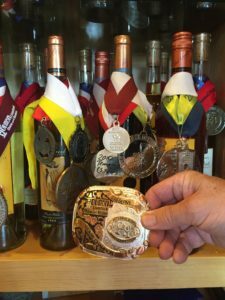 They hired a native Texan, Dave Reilly, as their winemaker, and quickly started seeing their wines medal in some of the most prestigious wine competitions. They have become one of the most renown and quality minded producers in Texas. Given the infant state of Texas, Duchman’s motto is not to be taken lightly: 100% Texas Grapes, 100% Texas Wine… And 100% Texas Farmers. A day will come, hopefully sooner rather than later, that all Texas labeled wines will be from 100% Texas fruit. Texas is not quite there yet. For a state the size of France, there is only approximately 5,000 acres of planted grapes… compare that to almost 1 million in California). Not all of that young acreage is producing usable fruit yet! Also, weather is an even greater contender, and Texas typical freezes and hails can lower fruit yields. Wineries often have to purchase West Coast fruit, just to meet the inventory they’ve committed to in their tasting rooms, wine shops and restaurants. A hotly debated legal loophole is the “For Sale In Texas Only” (FSITO) label statement. This is often in small print, of course, on the part of the label people don’t always read. It allows a producer to make a wine with less than 75% of Texas grapes in the blend. 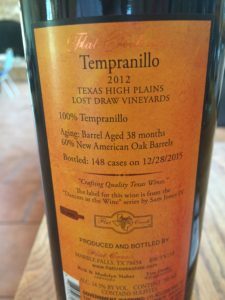 Though not unique to Texas, this labeling exception does make a number of consumers ask, ‘am I really drinking a Texas wine?’ Well, at Duchman Family Winery, they are. Duchman has strived, and succeeded, in making wines true to their varietal character from 100% high quality Texas grapes. 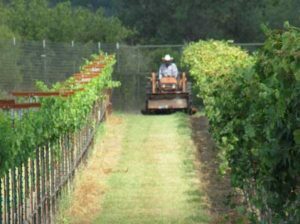 Duchman is growing grapes in two of the state’s 8 AVAs: Texas High Plains and Texas Hill Country. Texas Hill Country AVA is the second largest AVA in the US, surprisingly, after Upper Mississippi River Valley AVA. With 9 million acres, it has a number of unique microclimates, and most of the wineries and tourism are within this scenic area. Up in the Panhandle is Texas High Plains AVA, where the climate is very cool and dry, with an elevation of 3000-4000 feet. Both of these areas have been identified as ideal for grape varieties native to Italy, Spain, and the Rhone Valley. Traditional California varieties that are popular, such as Cabernet Sauvignon and Chardonnay, are hard to grow in many Texas regions. Grapes like Montepulciano and Tempranillo are much better suited to the temperamental climate and nutrient-rich soil of Texas. 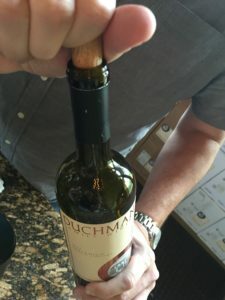 Back in the tasting room at Duchman, I realized that the grape varieties suited for Texas make for an exciting tourism opportunity and unique tasting sheets. We started with the 2015 Duchman Family Vermentino, crisp, nuanced, truly a world class palate. Another Italian variety, Montepulciano, has been produced at Duchman since almost day one. In tasting the 2012 Duchman Family Montepulciano, I realized why it’s one of the most popular wines in their selection, with balanced acidity, rich blackberry, plum, and aromas of vanilla and spice. There is no true consensus on which grape is the grape of Texas, but tasting these varieties would stand the test in a global blind comparison! Parting from Duchman was not without another Texas lesson: the wine growler. That 2015 Montepulciano walked out the door with us in a 750ml growler. Growlers typically make us think of beer, which has historically been approved by federal regulations. In Texas, Whole Foods has been a promoter of keg wine and in reusable containers, and helped pave the way for the Alcohol and Tobacco Tax and Trade Bureau to rule in favor of wine growlers. Only two states, Oregon and Texas, specifically allow retailers and wineries to fill growlers with wine for sale off-premise. Personally, I hope this legislation comes to New York state. Our Duchman Family Winery growler traveled quite a bit and proved the quality of Duchman’s winemaking. 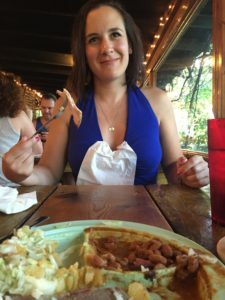 After the tasting room, we immediately headed to the nearby Salt Lick BBQ, a Texas Hill Country BBQ restaurant with recipes have roots back to the wagon trains in the mid-1800s! That Montepulciano shined with the rich slabs of barbecue. Surprisingly we didn’t finish the growler, and some Montepulciano accidentally made its way back to New York in our checked suitcase, where a few days later, it was discovered and tasted. Would you know, the Duchman Family Winery Montepulciano held up through the travels, and it was delicious! Rivers and lakes are known to form great wine regions, and our next visit brought us to to Lake Travis, just northwest of Austin. Perched on the lake is a parcel of land, an amphitheater like valley with gently sloping land, with a creek running from north of the property and ending in Lake Travis. That creek’s namesake, Flat Creek Estate Winery and Vineyard, calls this area home. I met with owners Madelyn and Rick Naber who lived in several regions of the US and for a number of years resided in California. There, they became great fans of wine. Once in central Texas, they began to notice that the pace of housing development was accelerating drastically, with developers especially snatching up premier property in the Lake Travis area. In 1998, the Nabers purchased an idyllic 80 acres on the lake, with a commitment to maintain its use as a sustainable agricultural endeavor. April Fools Day, 2000, became a legend. 60 people planted 6000 vines on 6 acres, thus beginning commercial grape growing at Flat Creek Estate. Later, the endeavor grew to 20 acres of vineyard, with a wine production facility, a wine tasting room, and a restaurant. Many of the varieties at Duchman, Sangiovese, Montepulciano and Tempranillo, also thrive at Flat Creek, along with several Portuguese Port varietals. 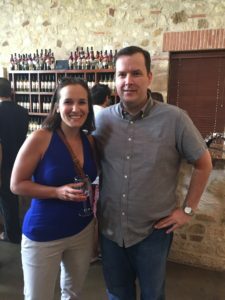 Madelyn and Rick sat down with me to share their wines, popping their 2014 Super Texan. This wine is based on the Italian Super Tuscan, a blend of Tuscan Italian and non-Italian grapes. At Flat Creek, they start with Texas Hill Plains AVA fruit, and blend the expected Italian Sangiovese, with Tempranillo and Syrah. The Nabers shared with me that their 2003 Super Texan was awarded a Double Gold in the San Francisco International Wine Competition, marking the first time a Texas red wine was awarded this prestigious accolade. The shining star and indicator of Flat Creek’s full viticultural and winemaking potential: the Port VII. The Flat Creek Estate Port is crafted from traditional Portuguese port wine grapes grown on the estate specifically for this purpose. Each vintage is aged in oak barrels and then added to the Port Solara which includes multiple vintage years spanning 2002 through 2014. Bottled in 2015, the Port VII is rich dark chocolate, blackberry, sweet spices and prunes. What a winemaking undertaking! All of my conversations at Duchman and Flat Creek hovered around the current state of Texas wines. What are the challenges? How do they overcome these challenges? What is the fullest potential of Texas? Even though Texas is America’s number 5 wine producer, it’s still grappling with an underdog status. Much of this is self imposed, because when the industry started anew after Prohibition in the 1970s, many producers were pushing for sweeter profiles and easier sells, like Merlot, Chardonnay and Cabernet. Most of these varieties suffered from climate challenges you’d never find in Napa Valley. Today, Texas winemakers are focusing more on terroir appropriate varieties, and learning how to manage weather challenges that seem to be the norm. Learn about Texas and other emerging wine regions on December 7th! 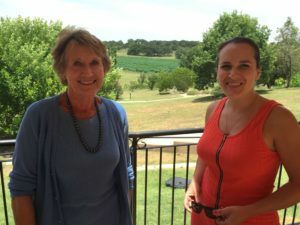 Wednesday, December 7, 7pm CST, 8pm EST – Emerging Wine Regions of the US – presented by Elizabeth Miller, CSW, CSS. Who knew that Texas had such a long history of wine production, and that the state grows more Vitis species that any other region on earth? Or that one of Virginia’s oldest wineries is exporting its wine to China. Did you know that Idaho has some of the highest elevation vineyards in the country, or that one of the best domestic méthode champenoise wines comes from New Mexico? This webinar covers the lesser known wine producing states, their terroirs, grapes and future growth. Elizabeth Miller is a retailer whose home state of New York is a successful emerging wine region. Next Next post: My Thanksgiving Dinner…Next Year, Maybe Sooner?